Gorgie Creative Network started up about a year ago, offering creatives and freelancers in the local area (the Gorgie, Dalry and Slateford neighbourhoods of Edinburgh) the opportunity to meet up and connect! Last year the network put together the first Gorgie Freelancers Festival which included some excellent events including a panel discussion on feminism for freelancers and a 'reusable mug decorating workshop' in conjunction with Gorgie Collective, which I blogged about here. As I type, we're in the middle of the Firestarter Festival (a 'two week long festival of collaborative learning events, illuminating creative, disruptive and innovative ways in which we can all transform ourselves, our organisations and the wider system') which features two events from the Gorgie Creative Network: an excellent workshop on the value of networks which happened last Thursday and a workshop on Creativity which is happening tomorrow at Dalry 183 Creative and Cultural Hub (there are still some free tickets available for this, which you can book on Eventbrite). Starting from this month, Gorgie Creative Network will be expanding their work offering a monthly co-working Wednesday at Gorgie City Farm, a chance for people to work together in a pleasant environment, particularly useful for freelancers who often are working alone. As regular readers of this blog know, I'm a great fan of Gorgie City Farm and know it's a great place to work, though somewhat distracting with all those cute animals. Another new regular feature will be a monthly workshop. 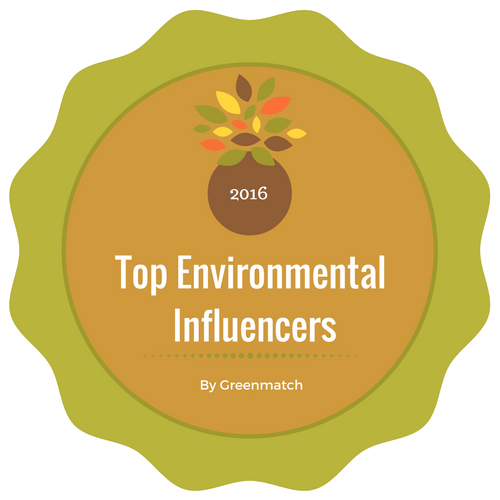 I'm delighted to be facilitating the first of these workshops on the theme of Greener Working. 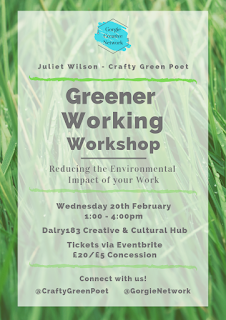 This will offer a space for creatives and freelancers (and others who are interested) to get together to discuss how we can make our creative and work practices more environmentally friendly. 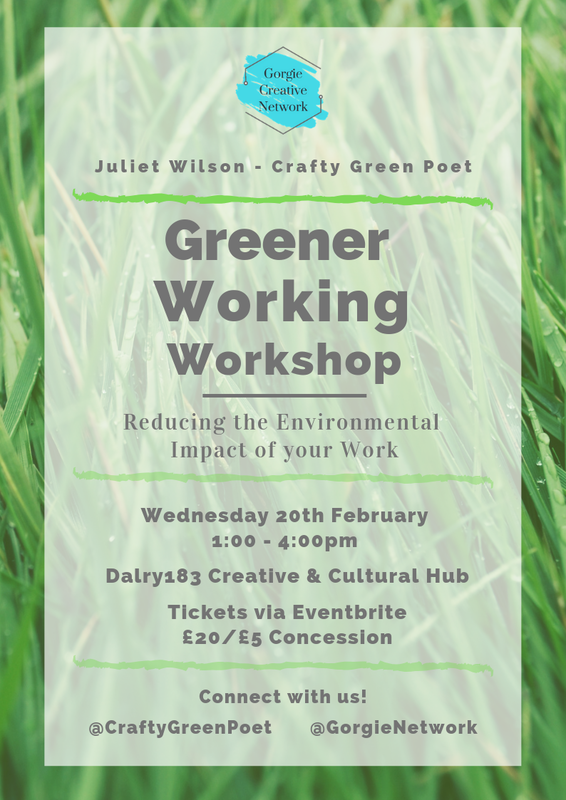 The event will take place on the afternoon of Wednesday 20 February at Dalry 183 Creative and Cultural Hub (which is to be the regular venue for these workshops) and costs £20 (with some £5 concession tickets available). 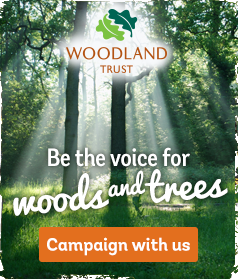 You can find out more and book on Eventbrite here. In the future I'm hoping to also offer a Creative Approach to Copywriting workshop in the same series. Updates to follow here as and when I know more.